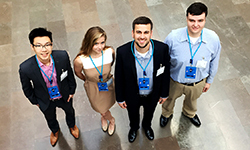 Erin Gorse, a PYII student at the Duquesne University School of Pharmacy, was on the first place team for both the national and international segments of the Novo Nordisk 2016 Innovation in Action Case Competition. The competition involves teams of graduate students from all academic backgrounds and multiple universities, who are challenged to use their talent and analytical skills to work together and propose solutions to real global issues. Gorse's team was tasked with coming up with a plan to help the citizens of Shanghai manage the disease state of diabetes, which is expected to dramatically increase in the coming years. The U.S. portion of the competition was held from Oct. 27-28 in Princeton, New Jersey. The American competition consisted of six teams–two were pre-formed from Columbia and Bringham Young. The other teams each consisted of five students from different schools. The other members of Gorse's team included a chemical engineering Ph.D. students, a Master's student studying data analysis, and two MBA candidates. Gorse said that experience as a student pharmacist gave her the most medical expertise in the group, although she was the youngest participant on her team and in the entire competition. "I received many compliments for my ideas, composure, and presentation abilities," Gorse said, crediting the preparation and support that she received from her School of Pharmacy professors. She said that her Duquesne School of Pharmacy education played a large part in her ability to be a valuable member of the team. "There is an emphasis on making things patient centered. If people don't take their medicine, they're not going to get better. That's emphasized from day one," she said. 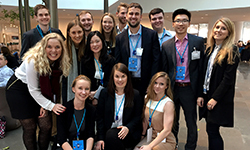 As winners of the U.S. competition, Gorse's team was flown to Denmark to compete against the finalists of the Danish/European competition. The international competition took place November, with the company flying Gorse's team to Denmark from Nov. 14-18. Her team took first place in the international competition, and many of their ideas are already being implemented in Shanghai. Gorse said that she was honored to have had the opportunity to represent Duquesne University School of Pharmacy on both a national and a global level.